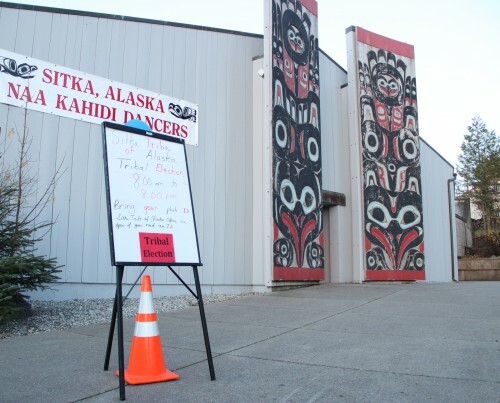 The Sheet’ká Ḵwáan Naa Kahídi, also known as the Tribal Community House, is the home of a Tlingit dance group and a venue for many events in Sitka. Built in the style of a clan house by Juneau-architecture firm MRV in 1997, the structure is overdue for an upgrade. At Wednesday’s (10-21-15) STA meeting, general manager Lawrence SpottedBird shared plans to apply for funding from the U.S. Department of Housing and Urban Development. They have a grant, capped at $600,000, called the Indian Community Development Block Grant Program. SpottedBird is chasing it to address various issues with the building. At the top of the list is replacing the roof with a material called Enviroshake. “It looks like aged cedar when you install it and it reduces the maintenance substantially,” said SpottedBird. “It also extends the life. 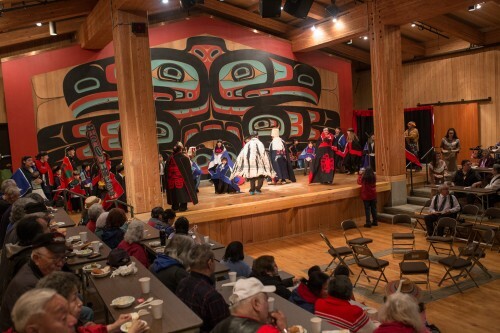 Annually we’ll just power wash the darn thing and it’s good to go.” Right now, the interior of Naa Kahídi is all yellow cedar, while the exterior is Sitka spruce and pine. If the council secures the grant, SpottedBird also wants to remove two massive panels, weathered with age, from the outside of the building, and store them temporarily at UAS. “[We want to] let the panels dry out and then some time next year, have artisans come and conduct a restoration to their original luster and then replace them,” said SpottedBird. SpottedBird said these panels were commissioned in the style of Tlingit art, but not approved of by any particular clan. Also on his wish list is to upgrade the kitchen for commercial use, so that it’s able to feed large crowds, and improve electrical efficiency by replacing with lighting with LED fixtures. With time, the council wants to bring the building up to snuff with modern performance standards. SpottedBird says he is seeking grants from the Rasmussen Foundation and other organizations to bring in a new audio-visual system. Right now, Naa Kahídi has a 40 foot screen and a seating capacity of 300. NextGet funky at Stardust Ball: Listen to the band here!